Ready and Sharkey “adopted” a duckling who had been cast off by her own mother. I cannot convey the cuteness of the three of them–Ready, Sharkey, and duckling Junebug–all together in a little house, proving that it’s not only humans who construct queer and sometimes multispecies families. The duck called Ready was rescued from a bad situation in Baltimore, Vermont. 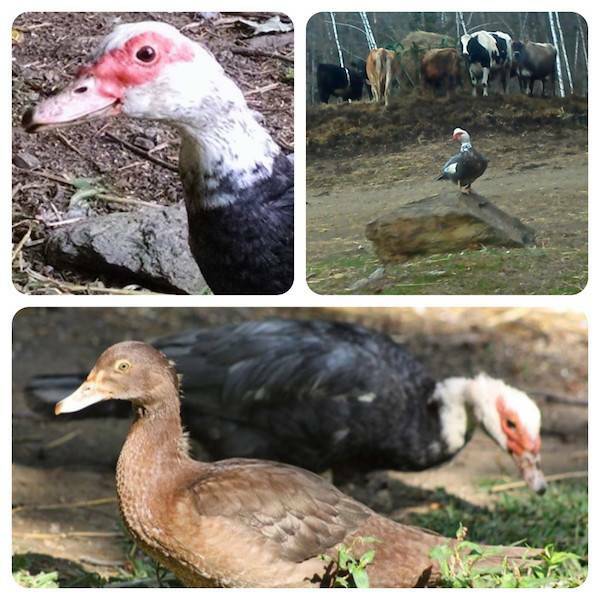 She and several other birds had been closely confined by a man who sold duck and geese eggs from his backyard. Nearby lived another man who exploited animals: a backyard puppy mill from which dogs often escaped to attack the ducks and geese. Those attacks turned out to be the surviving birds’ good luck, as the man who had been keeping them decided to give them up rather than continue to deal with the hassle. He jammed more than 40 birds into just a few crates left by the side of the road for a humane society volunteer to pick up. The person who picked them up found good private homes for all but ten ducks, who came home with her to the refuge she runs for donkeys. At the donkey refuge, one duck tended to stand apart from the others, wilder and more wary of human contact. When bringing treats out to the birds, the kindly donkey rescuer took care to make sure that duck got some, catching her attention by calling out “ready?” before tossing a treat directly to her. Eventually, the duck responded to the word “ready” as if it were her name, and so it became her name. There never has been a more apt name. Ready is ready for anything, always up for an adventure. That became clear immediately after her arrival at VINE Sanctuary, where her rescuer brought her and the other birds when it became clear that the donkey refuge was not sufficiently safe from predators and also that caring for all those birds along with the donkeys was too much for one person to do. This was a selfless act, as she had become deeply attached to Ready and the other birds she brought to VINE. Sometimes love means letting go. Here at the sanctuary, Ready immediately distinguished herself as an intrepid and sometimes reckless bird who often chose unwise spots in which to nest for the night. I literally cannot count the number of times we have been out in the dark with flashlights, not able to go to bed ourselves until finding Ready and conveying her to a safer place for the night. Eventually, Ready chose to abandon the coops altogether in favor of bunking with the former fighting rooster called Sharkey, who had recently become a proud homeowner when Cheryl built him his own little house next to my Airstream. She just moved in! And he didn’t mind! Later, Ready and Sharkey “adopted” a duckling who had been cast off by her own mother. I cannot convey the cuteness of the three of them–Ready, Sharkey, and duckling Junebug–all together in a little house, proving that it’s not only humans who construct queer and sometimes multispecies families. Junebug grew up and had ducklings of her own, so Ready is now the “grandmother” of Orlando and Trey. Junebug moved into the chicken coop and yard we call “Wayne’s World” to do that, and Sharkey soon followed, discovering the joys of living with hens. (Junebug is fiercely protective of Sharkey, which can be comical, since he is perfectly capable of fending for himself.) Ready began to spend her days in Wayne’s World but continued to spend her nights in what has grown into a compound of small coops around the Airstream, bunking with two of her nephews. We don’t know how long Ready will be with us. Of course, this is always true, with everyone we love, but our uncertainty is acute in this case. Noticing that she had been slowing down, and not wanting to mistakenly only attribute this to age, we took her to the vet yesterday. She has got a probably cancerous mass in her chest cavity, compressing her heart. This is not operable, so all we can do is keep her comfortable while wondering how long we all will have the good luck of her company. It might be a few weeks, it might be a few days. She might not wake up tomorrow morning. Right now, Ready is resting comfortably in Wayne’s World, surrounded by friends and family. I’m sitting nearby, wondering: How can we honor Ready, right now and after she flies away forever? I think that the thing to do is literally honor her name, to always be “ready.” What do I mean by that? Think about it. Discuss.